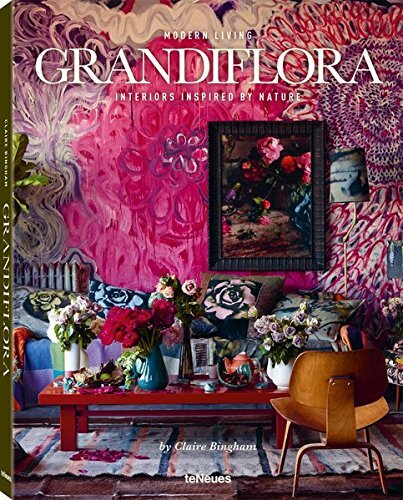 Modern Living – Grandiflora is an uplifting, inspiring, and practical guide to using flowers and foliage in the home. From lush greenery to modern florals, we step inside beautiful botanical interiors that lift your spirits with a cool mix of vibrant colors, stylish accessories, and elegant design details. Author and interiors writer Claire Bingham leads by example, sharing her passion for floral- themed houses and people who dream up eye-catching schemes using nature as their cue. Alongside the blossom-filled abodes, the book is crammed full of ideas for easy, seasonal floral arrangements to step-by-step guides to flower pressing the modern way. Bingham believes nature should feature highly in the contemporary family home. No space is ever too small for a potted plant or floral-patterned cushion. Anything that brings nature indoors counts for a lot! For one apartment in the Netherlands, dark charcoal walls show off vibrant, floral-inspired prints to dramatic effect. Elsewhere, glamorous botanical prints on wallpapers, fabrics, and accessories abound, yet the interiors remain elegant and balanced. Claire Bingham shares the styling secrets that make it all work. Pretty chinoiserie, vintage chintz, or cool palm prints, there’s a multitude of ways to revitalize your decor. Whatever your decorating delectation, Grandiflora will harness your flower power and teach you how to turn your home into a floral sanctuary.